After waiting 90 years for a first Winter Olympic medal on snow with Jenny Jones' 2014 snowboard bronze, Great Britain's chances of adding to the tally could be boosted by a new event. Big air - where snowboarders and skiers perform a trick off a large jump - has been recommended to the International Olympic Committee. The IOC will decide on 8 June and it could make its debut in 2018. Snowboarder Lesley McKenna said it would "double" GB's medal chances. Big air is one of a number of recommendations the International Ski Federation (FIS) has made to the IOC. McKenna, who competed in halfpipe in three Winter Olympics and is now GB Park and Pipe programme manager, told BBC Sport: "If big air becomes an Olympic sport it would be a very exciting prospect. "We have world-class big air athletes and there is strength and depth with lots of youngsters coming through too. "It's in the IOC's hands but there's lots of goodwill from FIS to push for big air to be in the Winter Olympics." 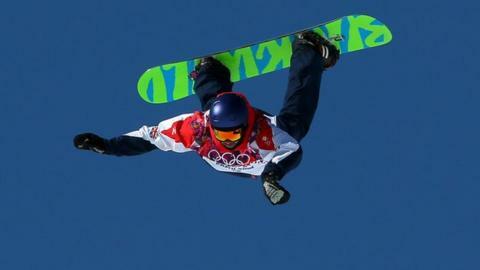 GB snowboarder Billy Morgan said: "It would be epic if big air is included." Morgan, seventh in big air at this year's World Championships, was part of Team GB which competed in slopestyle when it burst onto the Winter Olympic stage in Sochi a year ago. Team-mate Jones claimed her bronze in the women's snowboard slopestyle to become Britain's first Winter Olympic athlete to win a medal in a snow event. Britain boasts a number of world-class freestyle skiers and snowboarders who compete in both slopestyle and big air, including Morgan, Jamie Nicholls, his cousin Katie Ormerod and Aimee Fuller. Skiers Katie Summerhayes and James Woods showed their credentials by finishing second in big air at the World Tour Finals in Whistler, Canada, at the weekend while Isabel Atkins is another name to look out for. After the instant television success of adding snowboard/ski cross and then slopestyle to the Olympic programme, big air could become the latest freestyle addition in PyeongChang. The IOC said it had received a number of proposals for new events from international federations and was currently carrying out on-site assessments before a decision was made by the executive board. "It's a logistical question as to whether PyeongChang can handle another event, but we only had two years notice that slopestyle was going to be in Sochi," McKenna added. "If it is too soon for PyeongChang then I'm confident it will be approved for 2022 and it will be full steam ahead from our point of view."